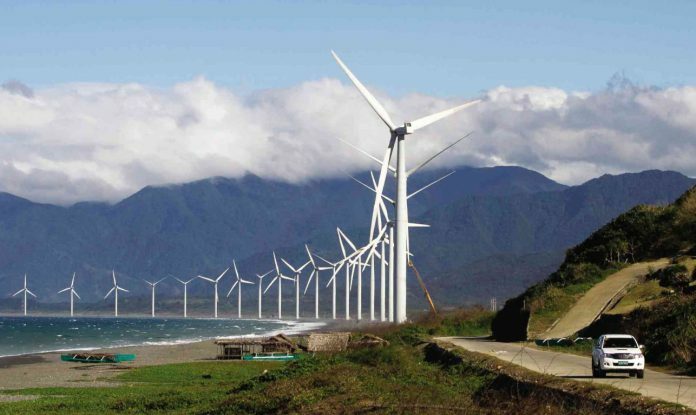 Going on a road trip from Manila to the northernmost point of Ilocos Norte to Pagudpud requires some planning. The 562 km drive will take as much as 18 hours if you’re lucky to escape Metro Manila traffic in good time, but a lot of those who did the trip this way feel that it was worth it. My husband and I decided to incorporate a side trip on our way to chop up the road into manageable chunks of driving, stopping at the Kahuna Beach Resort in San Juan, La Union for a couple of days to enjoy the beach. Come morning, we drove to Paoay through the Manila North Road along the blue coastline of West Luzon overlooking the West Philippine Sea. There simply isn’t a more scenic coastline drive. Of course, if you’re not too inclined to do all that driving, you can always get to Ilocos by plane. It’s an hour’s ride from Manila to Laoag and you can rent a car when you land. We made it to Paoay early in the afternoon and checked in at the Plaza del Norte Hotel and Convention Center before heading to Pagudpud — our final destination — the next day. The drive from Paoay to Pagudpud isn’t long and clocks in at about 3 hours if you drive nonstop; but I highly recommend taking a leisurely drive instead and visit Ilocos Norte’s historical sites. We started our day with a visit to St. Augustine Church, better known as Paoay Church. 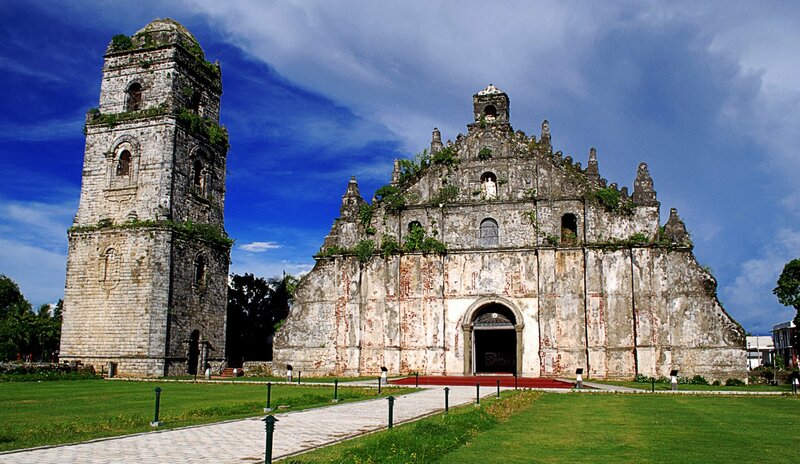 Built in Spanish baroque-style in 1710, it has an impressive facade that will give you a clue as to the strong influence of the Roman Catholic church during the 300 years of Spanish occupation in the Philippines. Most pictures belie the actual size of the structure — this one is huge. You will also notice that it is held up by big buttresses to help it withstand earthquakes and extreme weather. Today, it is a UNESCO World Heritage Site. It is Catholic tradition to make a wish when you visit a church for the first time. So when you get here, say a prayer before you enjoy the gardens behind the bell tower. 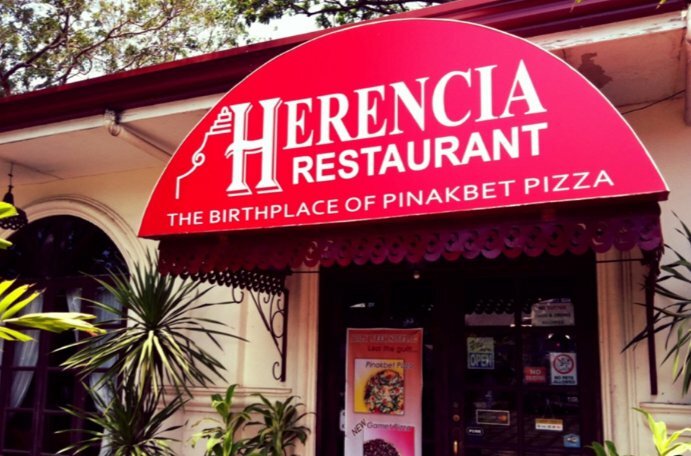 Across the street you will find Herencia, a restaurant that is something of an institution in Ilocos among locals and tourists alike. 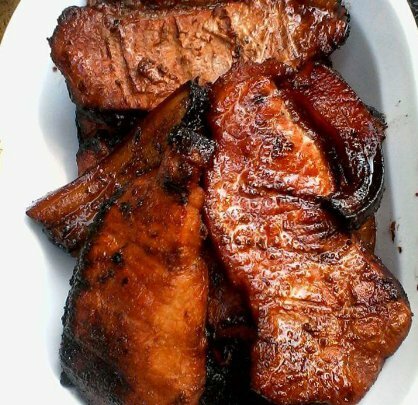 A visit to the region will never be complete without an order of bagnet which is a crispy deep fried pork belly, but don’t miss out on their pizza! While pizza is not a local invention, Herencia has definitely made it their own by marrying it beautifully with local flavors. We ordered the pinakbet pizza — pinakbet being a local vegetable stew of squash, eggplant, bitter gourd, and okra cooked in fish paste — and the Ilocandia pizza which is topped with longganisa and onions. With our tummies full, we took to the Manila North Road once again and drove towards the town of Burgos to visit the Cape Bojeador Light House which was built to guide galleons entering through the rocky Luzon coastline. 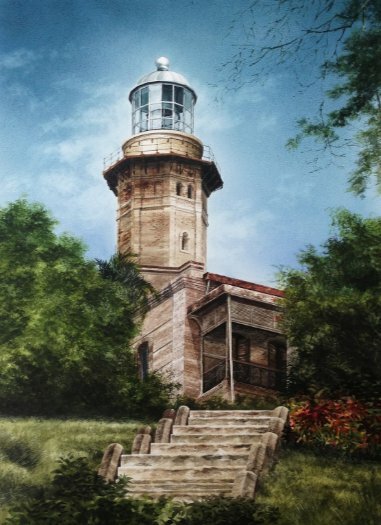 What is so special about this lighthouse is that it is the only original Spanish era lighthouse in the Philippines still in operation. When you get there, climb the steps onto the view deck to look out over the cape. Knowing that we were looking out at the northwestern most point of our country was an especially moving moment for us. A short drive from Cape Bojeador will take you to the starting point of the Kapurpurawan hike. Park your car and take the short trek through low grasses and pebbles to find the rock formation that is as white as its name — the Ilocano word for white is puraw. While there’s not a lot to do out there, the rock which was formed by the current of the West Philippine Sea is a sight to behold and is a good spot to enjoy the sea breeze and marvel at the greatness of nature. 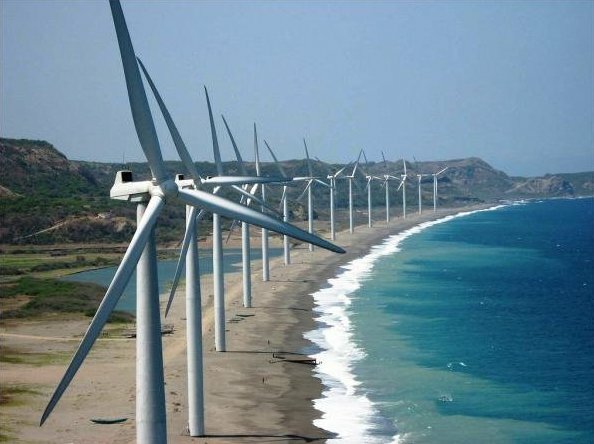 Along the coast of Bangui Bay you will find a row of white windmills lined up to follow the contour of the bay. We stopped at the view deck for a few pictures, but you can do better by driving down to the bay and standing by the graceful turbines. By the time we left Bangui, the sun was low on the horizon so we headed to the resort town of Pagudpud to stay for a couple of days. We wanted a quiet place that was off the beaten path and peaceful. We got all of that at Kapuluan Vista Resort, a small property with a few rooms and a wonderful organic garden where they get a lot of the food they serve from the kitchen. This is where you go if you want some peace and quiet to clear your mind and reflect. But it doesn’t mean that there are no activities there. Pagudpud has some of the largest waves in the Philippines and it is a surfing destination. If you’re the kind who wants to be alone with the waves, you will like that it hardly gets crowded so you can have the beach to yourself. It is also a surf school if a lesson is what you want. it was time to head back to Manila but not before visiting the Patapat Viaduct. The viaduct is a raised bridge that connects the regions of Ilocos and Cagayan and hugs the northern ridge of Luzon. To stand beside the curving road along the shoreline is to see my country touching the world through the extended arms of the ocean. We really are just one people. We came away from this coastal road trip both bigger and smaller people than we were. Bigger because we left feeling more and knowing more, yet smaller because being in touch with history makes one realize that one’s life is but a short blip in time. We stayed a little longer just looking out at the sea before taking to the road once again. It was going to be a long drive back home, but it was a drive filled with the elan vital that you only get from knowing your world a little more intimately than before.